Walking styles vary from person to person. Some people walk quickly, while other shuffle. Some people have heavy steps while others are light on their feet. Some people even have unusual ways of walking, often called gait abnormalities, which can result from developmental issues or injuries. This is especially concerning in children who are just learning to walk. Children in particular are prone to a few common problems with walking, though adults have their own gait issues. Baby steps are exciting, but they aren’t pretty. Typically they’re awkward and unbalanced to start. The lower limb muscles have to grow stronger so your child can balance and step forward successfully. After that, it takes practice and coordination to improve mobility. Even once your child figures out how to walk, his or her gait is recognizably awkward. Steps are short, stances are wide, and the little feet move quickly to walk successfully. All in all, it takes several years for a child to walk like an adult. Despite the naturally awkward footsteps, your child can develop problems with walking that look even more unusual than normal. These gait abnormalities may or may not cause trouble for your child. 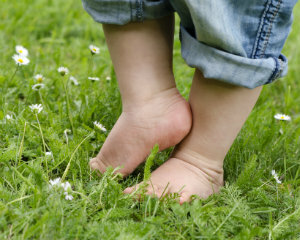 Intoeing – The toes point inward when your child stands or walks. Usually this is related to curving in the feet from metatarsus adductus, a twist in the shin from tibial torsion, or a twist in the thigh from femoral anteversion. Out-Toeing – Your child’s toes point out when he or she stands and walks. Usually this comes from an outward rotation in the hips, though a twist in the shins or thighs can cause it as well. Toe Walking – You child walks primarily on his or her toes instead of using the whole foot. Sometimes this is just a habit; other times, tendons are too short for feet to stay flat comfortably. Limping – Usually this is a side effect of pain in the lower limbs. In most cases, gait abnormalities in children are very temporary. Usually children outgrow them within a couple of years. For most of the underlying causes of intoeing and out-toeing, splints and braces to straighten the feet are ineffective and not very useful. Metatarsus adductus is the only cause of intoeing that might benefit from stretching or casting. If your child walks on tip-toe, he or she might benefit from physical therapy and stretching the Achilles tendon. A limp can usually be addressed conservatively, depending on the source of the problem. Occasionally, though, problems with walking signal bigger concerns. Neuromuscular disorders or limb deformities can make it very difficult for your child to learn to walk normally. As a precaution, any abnormal walking will be checked and monitored for systemic diseases and disorders like these that would need more involved treatment. Kids aren’t the only ones who can end up walking oddly. Adults can develop walking problems as well, including waddling, limping, dragging the feet, and a few other issues. Gait problems in adults are often a side effect of other conditions, from autoimmune diseases and systemic disorders to serious injuries. Arthritis, bone fractures, nerve damage, balance disorders, and even overuse injuries that make walking painful are other common causes. You’ll need an accurate diagnosis of the underlying problem to be able to treat it. Dr. Noah Levine will examine your lower limbs and search for the contributing factors to your walking issues. Depending on the source of your trouble walking, you might need physical therapy, shoe changes, foot braces, or even medications. Gait abnormalities can be very concerning, but monitoring the issues and treating the underlying problems should even out, or at least stabilize, your own or your child’s walking. You don’t have to stumble around. Let Absolute Foot Care Specialists help you today. Make an appointment online or by calling our Las Vegas offices.